Specially commissioned creation of iconic Wallace and Gromit characters. ​During our 150th anniversary year we were most fortunate to be gifted with a specially commissioned NIck Park creation of his iconic Wallace and Gromit characters. This 150 gift has been printed up as commemorative postcards and distributed at 150th anniversary events throughout the year. 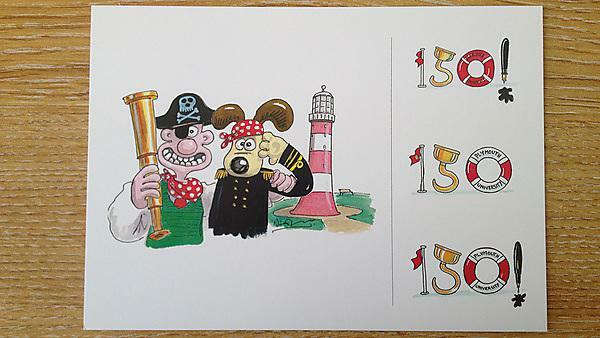 This exclusive drawing shows Wallace and Gromit at Smeaton's Tower and a specially created 150 logo. To thank Nick for this wonderful gift he was presented with a limited edition 150th trophy at his home in Bristol.